Rather than make a spectacle, HP has opted to launch its 8-inch tablet online with plans to grab a chunk of the budget Android market. The HP 8 has been officially released online sporting mid-range specs at a modest price tag. The 7.85-inch tablet features a 1,024 x 768 resolution display running Android 4.2 Jelly Bean with no word yet on an upgrade to KitKat. Internal specs include expandable microSD storage, 1GB of RAM and 16GB internal storage. The stereo speakers integrated into the device are pretty standard and the 3,800mAh battery can keep the tablet alive for only seven hours at a stretch. It weighs only 0.69 pounds and comes with 25GB of free lifetime cloud storage via Box, Kingsoft Office, Skype, HP ePrint, and a few other apps, including several Google Play services. 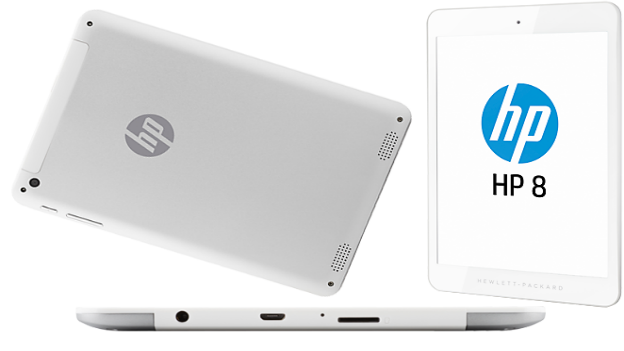 The design-style of the HP 8 is a reflection of clean lines and minimalism, not too dissimilar to the iPad Mini. HP need some redeeming following the launch of the 7-inch HP Slate 7 last year which was met with mostly unfavorable reviews. The HP 8 is available now for $169.99 on the HP Official Site.